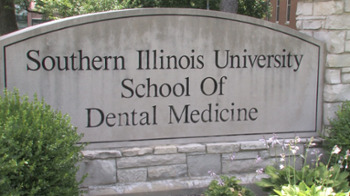 The Southern Illinois University Edwardsville School of Dental Medicine will bestow doctor of dental medicine degrees upon 50 students during its commencement ceremony being held at 10 a.m. Saturday, June 4 in the Meridian Ballroom of SIUE’s Morris University Center. The 41st class of graduates will receive their doctoral hoods, symbolizing the completion of their advanced professional degree. The students have been enhanced by the School’s commitment to superior education, patient care, research and community service. George R. Zehak, DDS, an active advocate for organized dentistry and continuing education, will be featured as the ceremony’s keynote speaker. Zehak is president of the Chicago Dental Society, and has served as past president of the Illinois Academy of General Dentistry and past chair of the Chicago Dental Society Foundation. The commencement ceremony can be viewed live on siue.edu/tv. A reception for students, faculty and family members will follow in the Goshen Lounge.